I promise I will continue my series on the Bird Variation of the Ruy Lopez soon, but first I want to tell you about the Theoretical Novelty (TN) I played last night without realizing it! I met with my friend Gjon Feinstein to play some speed chess last night. Gjon is a master-level player who no longer competes in tournaments, in part because they are hard on his nerves but mostly because he now makes a living by teaching chess. I think that it is hard for him to mix the competitive aspect of chess with the nurturing and teaching aspect. Or perhaps he just doesn’t have time bothÂ to prepare for playing in tournaments himself and do a good job as a teacher. Or maybe he is satisfied with playing online! I know he does that, a lot. Anyway, Gjon still loves playing blitz, and he is way better than me at it, because he grew up playing in Washington Square Park in New York with the sharks and the hustlers. When he gets down to a situation with both flags hanging, he has the knack for whipping out 20 or 30 moves in 20 or 30 seconds without having a single one of them be a blunder. It’s awesome to watch, and I just can’t keep up with him. If I try to play that fast, it’s guaranteed that I will hang a piece. Last night Gjon had a new chess clock, and we used a setting that was unfamiliar to both of us: 20 moves in 5 minutes, followed by 20 moves every 2 minutes thereafter. That negates some of Gjon’s lightning-reflex advantage, but I think he would rather play good chess games than win a lot of games on time. Okay, so now let me get to the point. Our last game began 1. d4 Nf6 2. Nc3 d5 3. Bg5, the Veresov attack. This was not a big surprise to me. 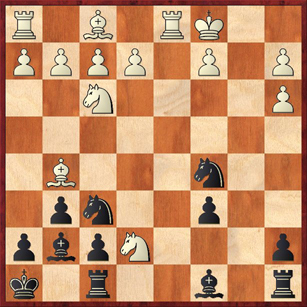 Back when he was young and a swashbuckling attacker, Gjon used to play the Blackmar-Diemer Gambit (3. e4) a lot, and he still plays it now and then. (After all, everything is sound in speed chess). But the Veresov is sounder, and it still offers some Diemer-like possibilities, as we’ll see. I continued 3. … Nbd7, which was recommended years ago in a Chess LifeÂ article by Mednis, and that’s still the only theory I know in this opening. Gjon continued 4. Nf3 g6 5. Qd3 (diagram). The move 5. e3 is more common, but 5. Qd3 has been played in 76 games (to date) in the ChessBase online database. White shows that he still has aspirations to play e4. Most games in the database continue 5. … Bg7 6. O-O-O O-O 7. e4, and in fact that is what happened the first time Gjon played this against me last night. But in our last game, it was already late and I was feeling a little bit unhinged, the way one always does after a long session of speed chess. The move I really wanted to play was 5. … c5, striking at White’s center in Gruenfeld fashion. The trouble is that it’s a true gambit; after 6. dc Nxc5 7. Qb5+ Nfd7 White wins a pawn with 8. Nd5. But in true late-night fashion, I said to myself “**** it, I don’t care.” And I played 5. … c5! ?, which according to ChessBase has never been played in history. Not once! It’s my very own theoretical novelty! Naturally, Gjon played 6. dc, and instead of taking back I just keptÂ right on developing: 6. … Bg7 7. O-O-O O-O 8. Nxd5 (Sure, just keep on taking my pawns, I don’t care!) 8. … Qa5 (At this point Gjon said, “Wow, you’re really goingÂ all in!”) 9. Nxe7+ Kh8. This is definitely late-night madness, or inspiration, or both! Black has sacrificed three pawns, but look at all his threats–against the a-pawn, the c-pawn, and along the long diagonal. It’s not at all clear how White should defend. Let’s look first at what happened in the game. Gjon played 10. Kb1, certainly the most obvious move and one that Fritz gives a thumbs-up to. But now I played 10. … Nxc5 11. Qd2 Qb6 and already moves like … Nfe4 are in the air. Here Fritz gives the apparently suicidal 12. Qd4, a move that no human would even consider, as White’s best option, and 12. Qd6 as the only otherÂ way for WhiteÂ to even stay in the game. Instead Gjon played 12. Ne5?, a reasonable try, hoping for some back-rank trickery after Nxf7+, but I simply answered 12. … Be6, and Gjon … lost on time! It was completely unbelievable to me that Gjon would lose a speed chess game on time in 13 moves. But look at the position! What can White do? White has three pieces that are all going to be hanging soon; he has to worry about mate on b2; and he also has to worry about … Rad8 with back-rank mating threats. Fritz’s best suggestion for White is 13. Qf4 (with a 1.75-pawn advantage for Black) 13. … Nfe4 14. Rd4 Nxg5 15. Qxg5. Of course, the computer has something fiendish in mind: if Black plays 15. … f6?? 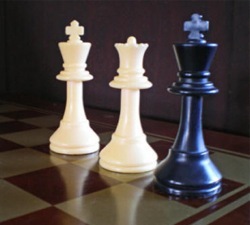 forking queen and knight, White has a mating combination: 16. N5xg6+! hg 17. Qh4+ and mate next move. But if Black plays simply 15. … Rad8, White is really toast. 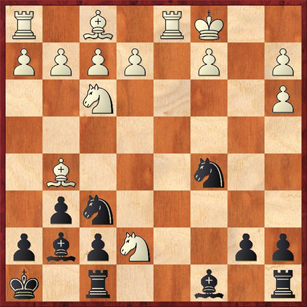 After, say, 16. e3 Black plays … Na4! threatening mate on b2, and White can’t take the knight because of the back-rank mate. So let’s go back to the position in the second diagram. Gjon’s 10. Kb1 didn’t work out very well. After the game we looked a lot at 10. Qa3 Qxa3 11. ba Nxc5, but if this is White’s best hope than Black has to be feeling pretty good. The computer recommends 12. Bxf6, again a very non-human move that, to me, says that White is desperate to trade pieces. 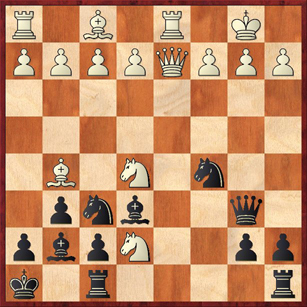 On other moves, like 12. e3, Black’s position is just going to play itself, with moves like … Nfe4, … Nc3, … Na4, … Be6 all in the offing. 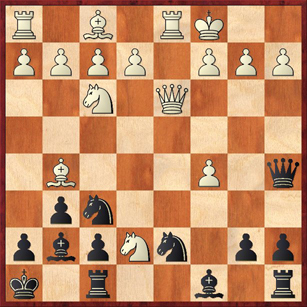 Also notice that unless White plays Nxc8 soon, his knight at e7 is in danger of being trapped. I was very curious to see if the computer could find any way out for White, and in fact it does suggest a probable improvement on move ten: 10. c6! Basically, the idea is to go into a variation just like the one above except with a slightly better pawn structure for White. The main line is 10. … Nc5 11. Qa3 Qxa3 12. ba bc. Look familiar? It’s just the previous position, with the pawn on b7 moved to c6. White now has a choice between 13. Nxc6 (with a small +/= advantage for White, according to the computer, but this looks totally playable for Black) or 13. Nxc8 (= according to the computer, as White’s extra pawn on the kingside means little and his extra pawn on the queenside means nothing). My comments above about Black’s game playing itself still hold true in this position. My feeling about the whole variation, in fact, is that Black’s game is just so darnedÂ easy, as long as you ignore the fact that you’re losing three pawns! You just move your pieces where they want to go. Ladies and gentlemen, this is how chess should be played! 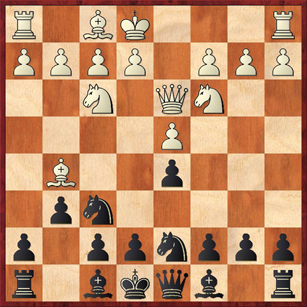 Although I will almost certainly never get to play this in a tournament, it’s another inspiring example of the ability of well-coordinated pieces to overcome even a big material deficit. Intriguing three pawn sac. let me take a closer look(on a board) without actually having to try to memorize the position.Till I comment again.